Open: Oct. 7 - Nov.
Saturdays and Sundays only. 9 - 5 pm. Wintergreen Tree Farm - Chestnuts - One of the nearest "pick-your-own" chestnuts farms to Cleveland, Akron, or Youngstown, Ohio. Bring the whole family and get pick'n! We have several acres of chestnuts and we supply the buckets for you to collect the best. 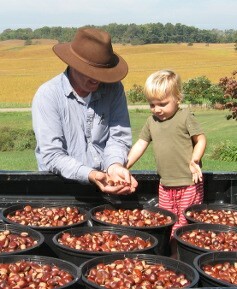 Pick-your-own are chestnuts are available for $3.25/lb. Pre-picked small sized are $3.50/lb, medium sized are $3.75/lb, and large are $4.10/lb. Please call ahead and we'll do our best to accomodate your schedule. Come on by and allow the Wintergreen Tree Farm to become a part of your family's autumn tradition.